It is 1974, but for Dr Mengele and his group of Nazis, World War II is not yet over. 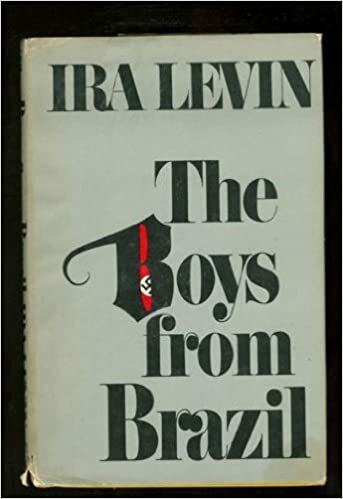 They have a terrible plan to conquer the world, but how does it involve a group of boys that come from different countries, yet all look exactly the same? Only one man can find out. "Penguin Readers" is a series of simplified novels, film novelizations and original titles that introduce students at all levels to the pleasures of reading in English. Originally designed for teaching English as a foreign language, the series' combination of high interest level and low reading age makes it suitable for both English-speaking teenagers with limited reading skills and students of English as a second language. Many titles in the series also provide access to the pre-20th century literature strands of the National Curriculum English Orders. "Penguin Readers" are graded at seven levels of difficulty, from "Easystarts" with a 200-word vocabulary, to Level 6 (Advanced) with a 3000-word vocabulary. In addition, titles fall into one of three sub-categories: "Contemporary", "Classics" or "Originals". At the end of each book there is a section of enjoyable exercises focusing on vocabulary building, comprehension, discussion and writing. Some titles in the series are available with an accompanying audio cassette, or in a book and cassette pack. Additionally, selected titles have free accompanying "Penguin Readers Factsheets" which provide stimulating exercise material for students, as well as suggestions for teachers on how to exploit the Readers in class. snarled, not moving. вЂњNice dogs,вЂќ Mengele said. вЂњSamson? Good Samson. Off. Go away.вЂќ He turned his head slowly against the settee arm; the Dobermans withdrew their heads a little, snarling. Mengele made a shaky smile at them. вЂњMajor?вЂќ he asked. вЂњAre you Major? Good Major, good Samson. Good dogs. Friend. No more gun.вЂќ His hand, red-wristed, caught the front of the settee arm; his other hand held the frame of the setteeвЂ™s back. He began turning himself up slowly from his side. вЂњGood dogs. Off.